Heston Blumenthal, Brendan Cole and Charley Boorman launch ‘all-star’ race to raise funds for the Cancer Research UK ‘Bobby Moore Fund’. The Celebrity Challenge, which will take place on Saturday 23 July at the world’s biggest classic car racing festival, will see an all-star line-up going head to head in 130mph Morgan V6 Roadster sports cars around the famous Silverstone Grand Prix circuit. Celebrity drivers including Heston Blumenthal, Brendan Cole and Charley Boorman will be team managed by legendary DJ ‘Whispering’ Bob Harris. The two top drivers from the 2010 Celebrity Challenge, musicians Rick Parfitt Jnr and Neil Primrose from rock group Travis, will also be on hand to renew their rivalry. Other famous faces confirmed for the charity fundraising event include Comedy Dave, Jonny Saunders, Neil Fox, Luther Blissett, Lord Charles Brocket and Paul O’Duffy. Further names will be announced in the lead up to the race. “The Silverstone Classic is a phenomenal thing to be part of,” added Brendan Cole. “It’s a massive event and to be at Silverstone, the home of British motor racing, and actually take part in a race is one of the most exciting things that I have ever done. Seeing Heston go off was pretty exciting too. I’m very happy to be taking part again and raising money and awareness for the Bobby Moore Fund which is a great cause”. 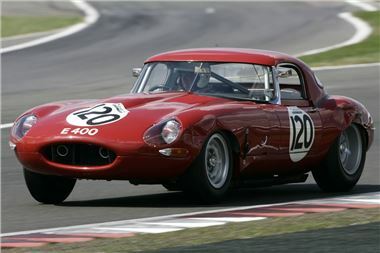 The Silverstone Classic (22-24 July, 2011) is firmly established as the world’s biggest classic motor racing festival. The spectacular three-day event, which celebrates its 21st anniversary this summer at the famous Silverstone circuit, is much more than a glorious celebration of motor racing heritage. It is a complete event dedicated to providing a fabulous day or weekend out for everyone, and it is getting even bigger for 2011. Featuring in excess of 1,000 drivers racing more than 800 of the world’s finest competition cars, this year’s Silverstone Classic has also been chosen to host the official 50th birthday party for the legendary E-type Jaguar. Around 1,000 E-types are due to attend and set a Guinness world record for the greatest number of E-types in a parade. Adding to the rich on-track entertainment, the Silverstone Classic also features a vast array of off-track attractions with festival catering by Jamie Oliver’s Fabulous Feast, a period fun fair, air displays, parades, and 7000+ classic cars and bikes on display. Live music concerts featuring rock legends Suzi Quattro, 10CC and Wishbone Ash are included in the ticket price guaranteeing a memorable day – or weekend – out for all the family.